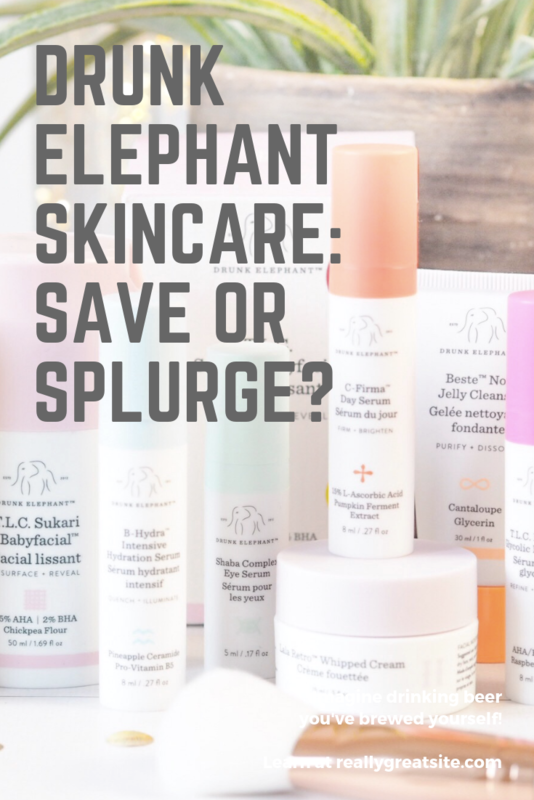 Not often do I go all out for buying new skincare products but I’d been obsessed with Drunk Elephant since last year when I’d spied them on the Sephora website. I was drawn in by the high level of top reviews on their products. It’s rare to find just so many rave reviews with very few negatives. It intrigued me. So when I heard they were launching here in the UK I was excited and waited with my breath held. When the collection finally landed I waited a week or two for the hype to die down (I never like to jump on a bandwagon) and made my first purchase. The difficulty with knowing where to start is like anything: it’s skincare, so is it going to work for you? The individual products are pricey. Even for premium skincare, they’re pricey. But that alone shouldn’t put you off – good skincare follows the rule of ‘you get what you pay for’ in my experience. And some of the most expensive products in my collection have indeed been the best performing. So I’m not scared of spending on skincare if it works for me. I see good skincare as an investment. Our skin loses elasticity from around the age of 25 onwards, so looking after yourself is key to ageing gracefully and well. So that said, the prices didn’t put me off, and they shouldn’t put you off either. You just need to know where to start. 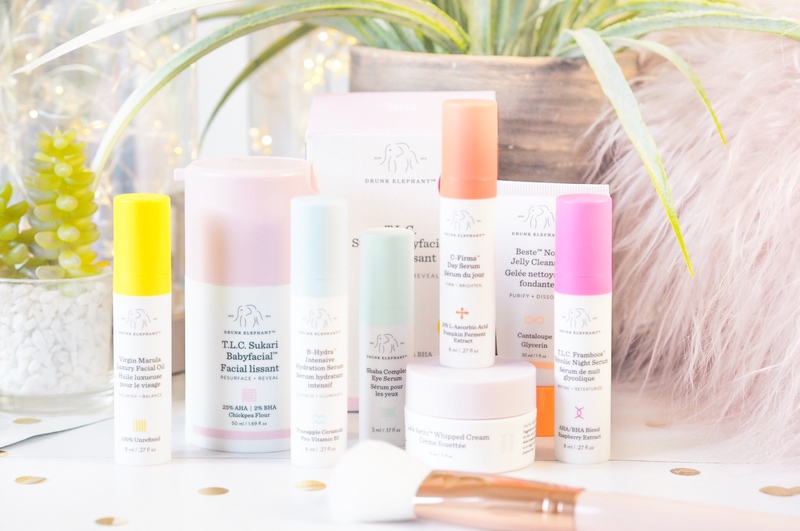 So across the selection, there’s everything you need to completely revamp your skincare. And this is the thing about Drunk Elephant: it’s designed to be used as a whole collection and regime together. Basically: don’t use other products with it. Usually I instantly dislike brands who advise against mixing their products in with exsisting skincare, but I had been having break outs and mega oily looking skin for a while that didn’t seem to be improving so I thought ‘why not?’ (Although with hindsight, if you’re reading this and want to try specific products and not the whole collection, go for it – I highly doubt anything bad would happen!) So I went for it and abandoned pretty much everything I was previously using for a dedicated trial. 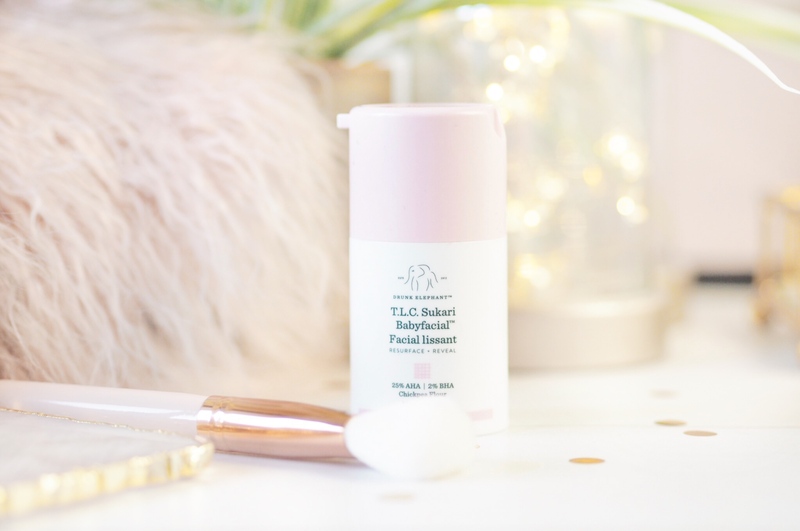 What I’ve been using is this: I start with my existing cleanser which is a cosmetic skincare cleanser and designed to encourage the next steps of skincare to work better. I then use the No 9 Jelly Cleanser as my double cleanse. It works really nicely and I feel like my skin is completely refreshed, clean and ready for the next stages between these two products. I like the way my skin feels after using this so the cleanser is on my ‘full-size-to-buy’ list now. 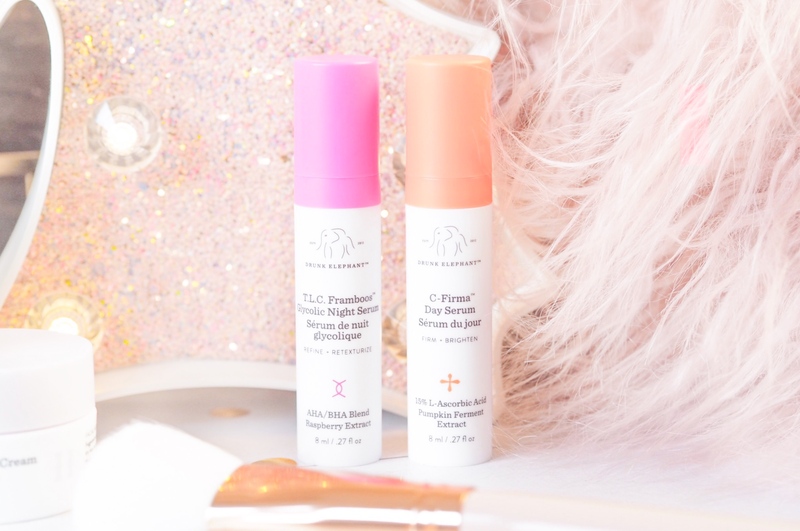 I then move to the T.L.C Framboos Glycolic Night Serum. This has 12% AHA so it’s going to really work well overnight while you sleep. It works wonders on me and I apply a few pumps to the palm of my hands and rub into clean skin. If my skin feels dehydrated, then I also apply a few pumps of the B-Hydra Intensive Hydration Serum too. Applied with the Framboos Night Serum it reacts so well on the skin – refining, resurfacing and rehydrating all while I sleep. 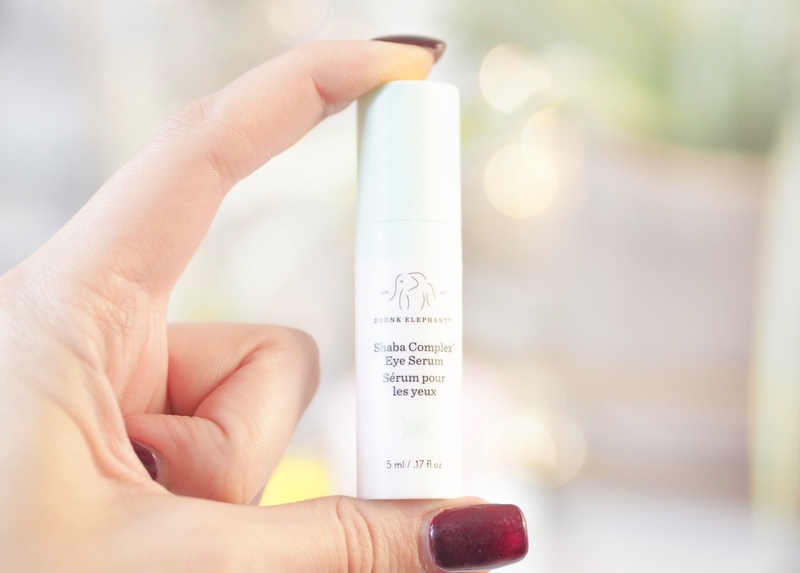 I then apply the Shaba Complex Eye Serum on my eye bags and in the eye socket (so around my lids and eyes as a whole) in small circular patting motions. A few tiny pumps is all you need for both eyes – a little goes a long way. Then in the morning I use the C-Firma Day Serum all over the face after my shower. I don’t cleanse in the morning, I have no need to. Just wash my face with warm water to open the pores then apply the serum all over. Sometimes I use the Eye Serum again in the mornings too if I’m not wearing make up that day. Otherwise it’s just the C-Firma Serum for day time. So that’s what I’ve been using. But how has it worked? I don’t think I’ve EVER seen my skin transformed so much in a month. I am converted and completely on the Drunk Elephant bandwagon with bells on. I’ve recommended it to everyone. The first thing you notice when trying the products is that they tingle. You’ll find high levels of AHA in their products – which is a.) why they’re so good and b.) why they tingle. AHA removes the build up on the top layer of skin like an acid peel/exfoliater, so it physically cleans the skin. 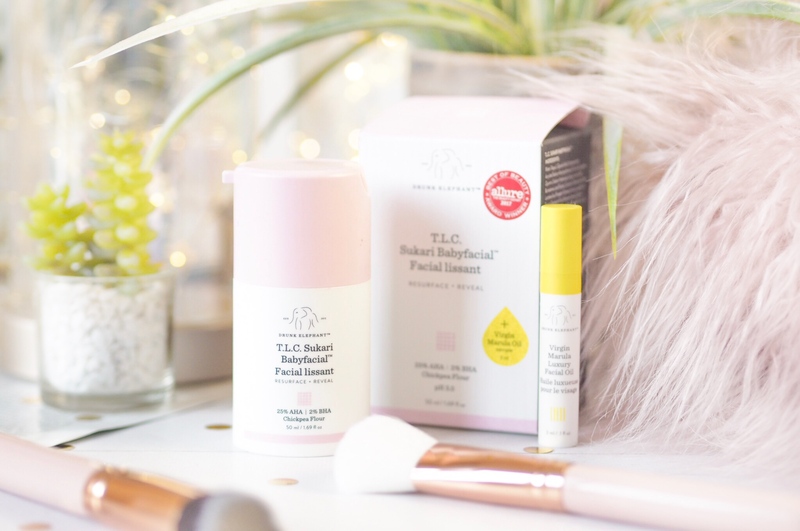 The tingling sensation takes a bit of getting used to – especially in the Shaba Eye Complex because you tend to panic when an eye cream tingles (I did anyway.) But after you get used to it, you barely notice it any more. And it’s far from painful. So with my cute Littles Set an the Sukari Babyfacial I’ve completely revamped my skincare. 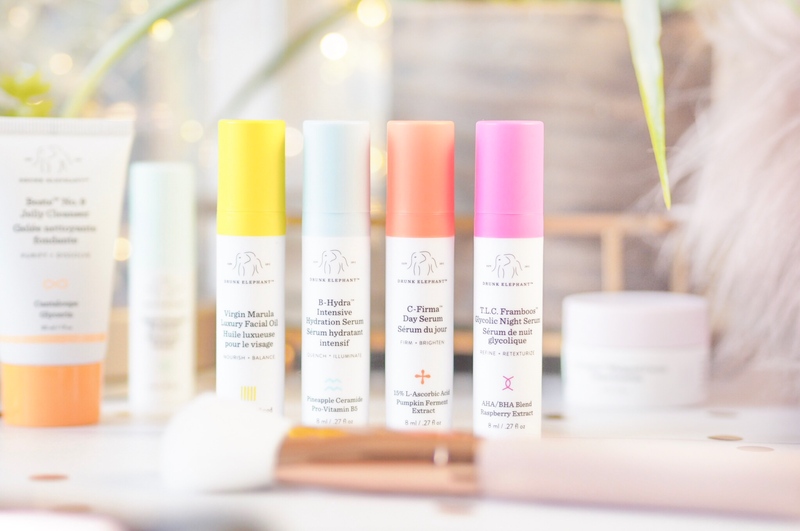 These are the only products I used while trialing and my skin has never looked better. I had a few breakouts (spots) at first while I adjusted, but once my skin got used to things, I saw a booming improvement. The breakouts lessened hugely and if I get the odd spot, it’s far less red and noticeable. My pores look smaller and my oily skin is for the first time ever, more controllable than I can remember. My make up lasts longer because my oil isn’t rubbing it off and my skin is more smooth and even in tone. It’s basically doing everything it says – WITHOUT A SINGLE DRAW BACK! I just look more youthful and…better, dare I say it. So just in case you wanted to take anything away from this review, it’s this: the price tag may have put you off, but the results are so worth it. 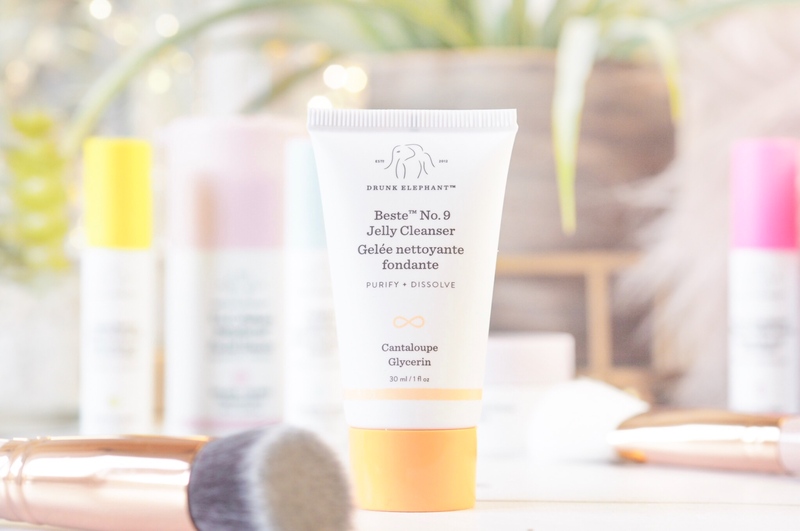 Invest in your skin and you’ll see the rewards and Drunk Elephant gets a 10/10 rating from me! 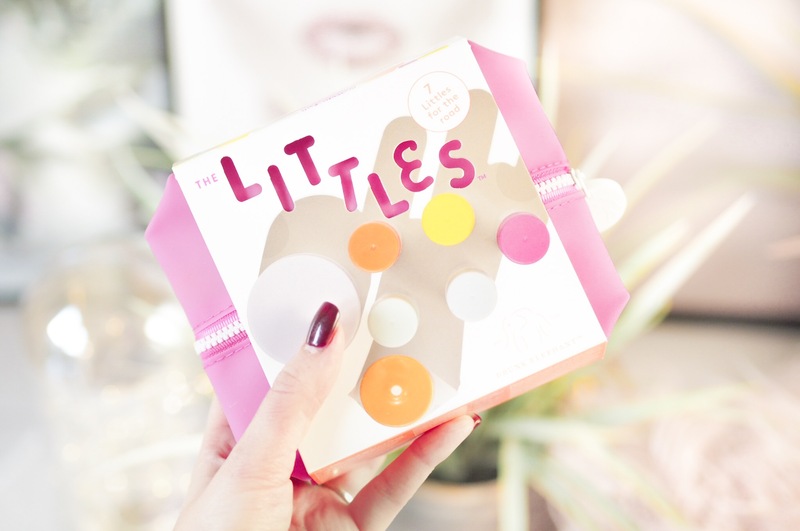 Start with the Littles Set and see how much you love it too! This brand is definitely worth the hype! I love the Babyfacial and Glycolic too! I’ve heard some amazing things about this brand, I’ve heard there are some vegan things too, so I might check them out! I was really curious about them and I am so happy they are worth the price! I’ll 100% be taking your advice on this and getting it. I didn’t realise the TLC facial wasn’t available here! Hat hats annoying! I wanted to try that most! You have made me really want to try these out, I was hoping to avoid them and not want to use them – don’t think that will last long! I love that they do these little taster sets – it’s such an expensive brand I’d hate to buy a full size product and then not like it! I really want to try this brand! I always use the same brands of skincare at once I hate mixing haha don’t know why? I really want to try them but they are so expensive!